So, the kids are coming in and asking for biographies, eh? And some of them Do Not want to read a biography. What do you give them? 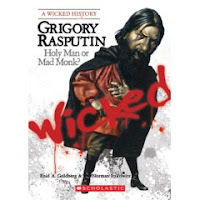 How about one of the books in Scholastic's new Wicked History series? Grigory Rasputin: Holy Man or Mad Monk? by Enid A. Goldberg and Norman Itzkowitz is an engaging biography about an intriguing historical figure. The action gets going from the first page as the book starts with Rasputin's death (by murder!) and then backtracks to his childhood and the rest of his life. Photos of Rasputin, different places in Russia, and people important to Rasputin's life are scattered throughout the book (with photo credits on the verso). There are also several text boxes at the ends of chapters that examine certain aspects of the story in more detail (for example, there's one about hemophilia, one about World War I, etc.). A map of Russia/Siberia is included at the beginning (I love maps) and all the important stuff (index, glossary, source notes, timeline, etc.) is included at the end, making this a good research book as well as an entertaining read. 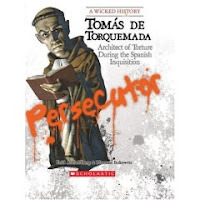 Tomas de Torquemada: Architect of Torture During the Spanish Inquisition by Enid A. Goldberg and Norman Itzkowitz is less of a biography and more of a history of the Spanish Inquisition. (The author's note explains that there is not a lot of information available about Torquemada before he became involved with the Inquisition.) Again, an interesting read and very useful for kids doing history reports. Paintings are scattered throughout the book that highlight the information included. This book presents an accessible account of the persecution of the Jews in the 15th century. It also starts with a map of the Iberian peninsula and ends with an index, glossary, source notes, and timeline. There are two more in this series: Vlad the Impaler: The Real Count Dracula and Genghis Khan: 13th Century Mongolian Tyrant. More are coming this spring (I hope they include a woman!). I'd recommend these books for middle schoolers and maybe upper elementary school kids. Although I think both of the ones I read give an overview of the historical events happening at the time, kids might get more out of them if they've already studied a little of the history. Both books are fairly short and I think they could appeal YAs, too.